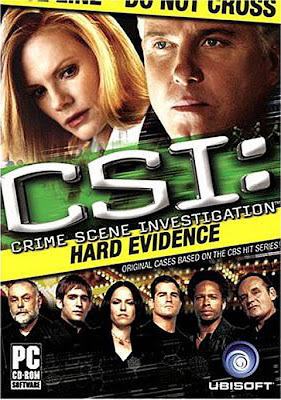 CSI: Hard Evidence was the fourth game in the CSI Las Vegas series. It was the second game in the series to be developed by Telltale Games. It was published by Ubisoft for Windows, MacOS, and Xbox 360 on September 25, 2007, and for the Wii on January 15, 2008. Like Telltale's other CSI games, this was distributed traditionally through a publisher to stores. The CSI games remain the only Telltale games that were released through a traditional developer/publisher arrangement. Like Telltale's first CSI game, 3 Dimensions of Murder, even though this game was sold as a single product in stores, it still retains the episodic nature of Telltale's other games. Once again there are five cases to solve by collecting evidence, talking to suspects, questioning other CSI members, and using all of the equipment available in the lab. The retail versions of CSI: Hard Evidence are out of print, but the PC version can still be purchased digitally online through Amazon. A taxi driver is killed from an arson attack in his cab. The evidence leads to a homeless man and two women who are in a relationship. A woman is repeatedly stabbed in her house and lives. It's discovered she was paid to be the surrogate mother for an aging millionaire. Four members of a rock band are killed by electrocution. Three of them worked together for years, but the singer was newly hired. An Indian American eye surgeon was murdered. His blind wife's the only witness. His daughter was to be wed in an arranged marriage. A clerk was shot repeatedly. A man confesses to the shooting, but it appears that his brothers, all of whom are triplets, are involved.